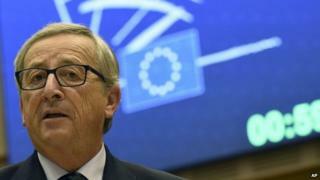 European Commission President Jean-Claude Juncker should be investigated over claims he encouraged tax avoidance when he was leader of Luxembourg, senior Conservatives have said. Work and Pensions Secretary Iain Duncan Smith said the commission should have "no fear of investigating their own" and urged "complete transparency". And Tory party chairman Grant Shapps said it was important that the commission was held to account. Mr Juncker has denied the claims. The government has had an acrimonious relationship with Mr Juncker since he emerged as the leading candidate to run the commission following May's EU elections. Mr Juncker, who took over as head of the EU's executive body at the start of November, has come under pressure over claims that some 340 global companies were granted deals to help them avoid tax during his 18 years in office, which ended last year. A report by the International Consortium of Investigative Journalists has alleged that firms such as Pepsi and Ikea made "sweetheart" deals with his government to save billions in tax in other countries. The revelations are to be looked into by the EU's Competition Commissioner, Danish politician Margrethe Vestager, as part of a series of investigations into tax arrangements in Luxembourg, Ireland and the Netherlands. Mr Juncker, who was Luxembourg's finance minister before becoming its leader in 1995, has insisted that all tax settlements reached under his leadership complied with national laws and international rules. Speaking in Brussels last Wednesday, Mr Juncker said there was "nothing in my past indicating that my ambition was to organise tax evasion in Europe". Asked about the issue during an interview on BBC Radio 5Live's Pienaar's Politics, Mr Duncan Smith said it was right that the matter was properly looked into. "This is a real moment for the European Union, for the commission, to show that it has the capacity and the determination to investigate its own," he said. Although he did not name Mr Juncker by name, Mr Duncan Smith said he would feel the same way if the official under scrutiny was British. "The trouble for the European Union historically has been that it circles the wagons around the people that are having the finger pointed at them and refuses to let any kind of change takes place," he added. "I think what is required from the European Commission is complete transparency." Conservative Party chairman Grant Shapps told Sky News he had not seen all of the evidence but it was important that the commission was held to account. The UK was one of two EU countries to oppose Mr Junker's selection as commission president and, since taking over, the Luxembourg politician has already been at odds with David Cameron, suggesting the UK prime minister finds it hard to get on with his EU counterparts. Asked whether Mr Juncker should stand aside while the claims are examined, shadow Europe minister Pat McFadden told Pienaar's Politics there was "little chance" of that. But the Labour MP added: "I think if more comes out on this then really serious questions will have to be asked about his position."